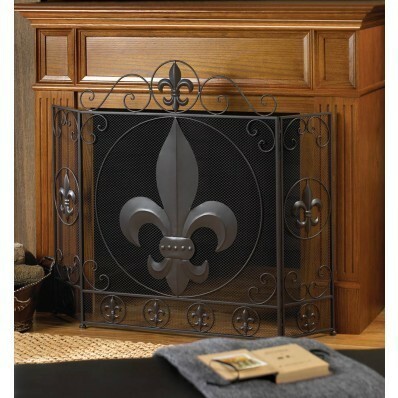 FLEUR-DE-LIS FIREPLACE SCREEN by Accent Plus home decor, jewelry, decor, decorations, electronics, fountains, floor mats, art glass, vases, garden essentials, fireplace screens. This stylish fireplace screen makes a big statement in your chic decor. The center panel of this tri-fold screen features a large fleur-de-lis symbol surrounded by metal flourishes and smaller versions. The side panels mimic the central design and are adjustable to fit into your space. Center panel: 25 5/8" x 25 1/2" high; 33" high with top detail; each side panel is 7 7/8" x 25 1/2" high. Material(s): IRON METAL - MESH METAL - SHEET. Weight 8.2 pounds. Dimensions	25.8" x 7.88" x 33".